Pregnancy. For millions of women and their partners, discovering that they are expecting a baby is a very exciting time. However, it can also be a quite stressful time; suddenly there are lots of things to think about. There’s the fun stuff – wondering whether you are having a boy or a girl, thinking about baby names and buying first items of tiny baby clothes. Then there’s the more serious stuff- thinking about a birth plan, and suddenly having to attend several doctor and hospital appointments. One other thing for expectant parents to think about is whether they get vaccinated against specific infections whilst pregnant – this is called maternal immunisation. This week, we celebrate European Immunisation week with the slogan of “Vaccines work- at all ages”. Pregnant women are a group that might not be on everyone’s radar for vaccinations, which we usually associate with children, right? However, maternal immunisation is a really clever way of enhancing what mother nature already does anyway: passing protective antibody from the mum to her unborn baby across the placenta. Therefore, giving certain vaccines in pregnancy will boost protective antibody in both mum and baby, therefore not only protecting the mothers from the infection, but their child in their first weeks of life. Maternal immunisation has been a huge success story – initially in countries in the world where a lot of babies used to die from tetanus infection – and now also in Europe. The two most widely used vaccines in pregnant women in Europe protect against influenza (flu) and pertussis (whooping cough). The whooping cough vaccine was introduced in several countries following large-scale outbreaks of the disease. Whooping cough is extremely serious in young infants, and in the UK alone it caused the deaths of 27 babies between 2012 and 2015. The response by public health authorities was decisive; vaccinating mums could help protect these vulnerable children. Following the rollout of maternal pertussis vaccination, large studies have shown that it is safe, and extremely effective at preventing whooping cough in young infants. But we still have some way to go. Studies in the UK show that despite overall maternal vaccination coverage continuing to rise, it’s still only reaching an average of 60% of the women who should have it. As part of our research at Imperial College London, funded by the NIHR Imperial BRC, we have held detailed interviews with pregnant women to seek their opinions on maternal immunisation and to find out why some chose to decline vaccination whilst pregnant. Their views were diverse, but one key thing we realised that we as researchers could address, was their desire for more information. As a result, we designed an app to fill this need- MatImms. 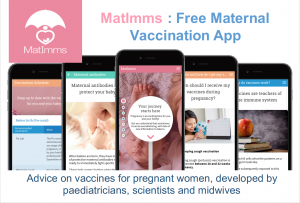 Developed by a team of scientists, clinicians and midwives, the MatImms app provides reliable information to expectant parents. It includes information about the immune system and how vaccines work, written in a clear and understandable way. It also provides detailed information on the current vaccines available to pregnant women, including how and when women can receive these vaccines. Finally, the app has a personalisable vaccination calendar, based on the woman’s due date, which provides reminders. Currently focused on the UK setting, we hope in the future to extend the app to include country-specific information to cover the rest of Europe. In line with this year’s motto for European Immunisation week, we know that vaccines in pregnancy work and many mums are already stepping up to help protect their unborn babies from life-threatening infections; now we want to make sure that our research helps and supports as many mums as possible in this decision. The MatImms app is freely available for iPhones and Android in iTunes and Google Play.